Many financial services organisations understand they must modernise their digital strategy to remain (or become) market leaders. A Gartner survey of financial services CIOs conducted this year found that “becoming a digital business” was the goal most often cited as respondents’ top business priority—even outpacing goals such as improving profit and customer satisfaction. The strength of this desire for digital transformation also far exceeded the average across all other sectors. These findings may come as a surprise to those outside of the financial services industry, but individuals with their boots on the ground will recognise the disruption the industry is facing in those results. Well-established financial services companies are increasingly finding themselves confronted with fast-moving fintech disruption. In a world where consumers want more, better, faster, these companies have found themselves competing with their digital-native counterparts—online banks such as Ally, as well as services such as Circle, Mint, PayPal and Venmo. On top of that, smaller firms are emerging every day with more bespoke solutions that solve diminishingly-specific problems. On their part, consumers expect the agility of smaller fintech companies from bigger guys, who they perceive to have more room to experiment and evolve. Facing these fresh challengers, many financial services organisations understand they must modernise their digital strategy to remain (or become) market leaders. They have found themselves asking: “How do we get faster and leaner?” There’s an urgent need to innovate to stay relevant, while simultaneously defending their core business advantage—their home base of customer relationships. They need to defend and block, but also adopt new digital technologies. While there are many reasons financial services companies may find themselves struggling with digital transformation, over many years of working with leading global brands we’ve found that these challenges often distill down into four common obstacles. Before a project even starts, a culture of innovation is vital to the success of any digital transformation. Remaining stagnant is the easy road, so it’s understandable to see why many organisations encounter resistance to newer technologies. For financial services organisations, which often default to risk-aversion, the uncertainty that comes with experimentation and innovation can paralyse digital efforts to the point of inaction. It can be common to look at a longer-term roadmap and move forward with only the work that feels comfortable, familiar, or seems to have expected and achievable outcomes. In this type of a culture, the more exploratory initiatives get consistently deprioritised until they eventually slip into backlog purgatory. Even when the desire for progress is there, creating a culture of innovation is much easier said than done. For larger financial services organisations, it often ends up being smarter to partner with or purchase smaller fin-techs that focus on a specific vertical or do one thing really well in order to jumpstart digital initiatives. However, that process doesn’t create the culture that supports ongoing innovation at larger organisations. Internal teams will often stay focused on keeping the status quo funded as new technologies are glommed on. Another obstacle we hear early in the process is: “Where do we start?” While most financial services companies and their CIOs have a picture in mind of what they want to look like, it’s hard to find the right path to achieve those goals. For the most part, companies know which technologies they want to use—the disconnect is in making transformation projects work on a realistic timeline and budget that all stakeholders can agree on. Organisations may also lack the people or skillsets to adapt to modern technologies successfully. 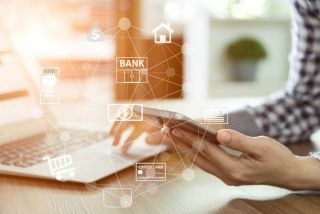 It can be a vicious cycle—most financial services companies have likely tried and failed at digital transformation at least once, reloaded and started again. Once that happens, a new executive will come in, decide to streamline something and generate excitement, but then delays and unclear expectations can squash those projects. This setback can often result in leadership changes, which starts the cycle all over again. Once digital transformational projects get underway, contending with legacy technologies and infrastructure is one of the biggest obstacles we see every day. Particularly for well-established financial services companies, building an ideal solution from scratch is not a practical option from a fiscal or timeline standpoint. Organisations have existing hardware and software deployments and dependencies that they need to figure out how to work with or phase out. These realities must be factored into the equation in order to come up with a realistic approach, timeline and budget. As programmers will tell you, legacy development work can be just as problematic as legacy technology. This issue is known as technical debt—extra development work that piles up because teams use workarounds that are faster or easier to implement in the short run, instead of taking extra time to apply the best overall solution. In financial services, this often happens because established players are rapidly bringing in new technologies through acquisitions or mergers, creating an architecture that’s a Frankenstein project of smaller pieces. it’s not sustainable, and it doesn’t scale well. On top of that, a revolving door of executives and tech talent over time creates complexity that few to zero people understand. Digging out of technical debt isn’t exciting—people want to create something new, not pay for problems that are already there—but it is very necessary for building a robust digital business. Organisations that want to overcome these obstacles need to start by aligning stakeholders from across all facets of the organisation behind the company’s innovation efforts. Contrary to some perceptions, digital transformation is not just about technology, it’s also about business process and organisational changes. Business leaders need to give themselves and their organisations the permission to experiment, take risks, and potentially fail. However, they should not expect radical change overnight. Start small, establish building blocks, and over time radical change will begin to emerge. It can also be helpful to bring in a third-party partner to help mitigate some of the political challenges and unstick the resistance to change or differences in priorities. A good digital services provider can help lead the way from a position of impartiality and foster a dialogue that gets all stakeholders on the same page much more easily. Before getting started, a detailed plan that clearly articulates the project goals, existing dependencies, budget and timeline helps ensure all stakeholders are being realistic about the project requirements and scope, and also makes it easier to see where the project should start. Assumptions and ambiguity can put even the best developers off track. Nearly every project I’ve seen get mired in challenges or end poorly has come back to miscommunication between and among stakeholders, managers and developers. Having a process for getting everyone on the same page and setting realistic expectations is absolutely crucial. Once the project starts, this plan makes it easier to see if any components that are falling behind or going over budget, and catch those derailments early. Legacy systems must also be addressed early in the process. Starting from scratch is never an option, so salvaging value from legacy systems is vital. However, this must be done with an eye towards the future. Components such as hardware or cloud deployments are necessary investments, but are also low on the value chain when it comes to digital transformation. We know these technologies and vendors will evolve, so it’s important to avoid too much investment in components that could result in infrastructure or vendor lock-in down the line. Developing strategies for legacy modernisation and integration means looking higher on the digital transformation value chain and architecting for innovation. Businesses should be creating a platform that can serve as the core or “spine” of your digital enterprise. Building new solutions based on a flexible enterprise architecture will help the organisation begin to dig out of its technical debt, while creating building blocks that can be swapped out more easily down the road as your business evolves.